What do Michael Phelps, Justin Timberlake and Jamie Oliver have in common? They are all super successful in their field, right? They all have these incredible talents that have impacted the world in some way. But what they also have in common is that they all have ADHD. ADHD has been on the rise for the past twenty years and continues to rise at an extremely fast rate. The CDC reports now that 11% of children (ages 4-17) have ADHD. Kids and adults with ADHD are some of the brightest people I know – they just need a little help channeling their energy correctly so they can THRIVE and not allow this diagnosis to hold them back to their true potential. I could write for 10 pages on what has changed for kids, why I feel this condition is so prevalent and what needs to be done to correct it. 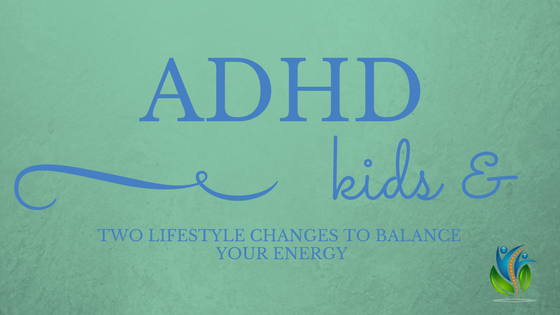 Instead, I want to discuss what I believe are two of the most important factors that need to be addressed if your child has ADHD, or any sensory processing disorder, with getting their energy back into balance. The amount of processed, packaged foods that our children eat is alarmingly high. By making some simple healthy lifestyle changes, parents often report improvement in behavior almost immediately. Start by eliminating all food dyes, preservatives and additives from their diet. Artificial food dyes have been proven to cause hyperactivity in children and are banned in most countries or at least come with a warning label on the box. Focus on wholesome organic foods. Get rid of sugar and avoid all artificial sweeteners. Determine if an allergy/food sensitivity is involved such as dairy or gluten. Make sure they are getting enough water throughout their day. Dehydration in kids can look a lot like symptoms of ADHD. Kids should be drinking half of their body weight in ounces daily. Make sure they are getting enough healthy omega 3 fats. This is a huge component to the health of our brain and nerves in order for them to function optimally. If the child will not eat fish, a high quality fish oil supplement can help increase those good fats in the body. Have them start their day with eating a good source of protein such as eggs. Breakfast cereals are loaded with food dyes, preservatives and sugars, which cause blood sugar to spike and then crash, making children much more irritable and emotional. Protein helps to stabilize blood sugar levels and is so important to eat throughout the day, especially breakfast. The central nervous system is the most important system in the body as it controls and coordinates the function of every cell, tissue and organ. And is the second most important factor that I want to discuss. Their CNS is constantly stuck in a state of sympathetic dominance and fight/flight survival mode. We refer to this as the “gas pedal” mode of the nervous system. This is where hyperactivity, fidgeting, anxiety, difficulty sleeping, constipation, impulsivity and things of this nature live. The other side of our nervous system is the “brake pedal” which is the parasympathetic side which is responsible for growth, development, digestion and calmness in the body. This is where a child should spend the majority of their time. As a result, kids with ADHD typically have poorly organized and integrated nervous systems. This is where chiropractic care can have a significant influence in kids with ADHD and other sensory disorders. While many people think of chiropractic as back or neck pain doctors, few people realize the connection to the spine and brain and CNS. The spine/brain/CNS is the key communication component between the brain and the body and proper function of this system is critical as it is what drives and powers the brain. We almost always see problems involving the nervous system with spinal misalignments in the upper neck in kids with neuro-developmental disorders. At DC Wellness, we have technology in the office where we can measure and evaluate the function of these nerves. With this technology, and through a series of safe and natural chiropractic adjustments, we can build up the ‘bicycle brakes’, restore order, and create calmness in the nervous system. We have seen and successfully helped many kids with a wide variety of neuro-developmental disorders. If your child has the symptoms of ADHD and you want to learn more, call our office to schedule an appointment today!